LAS VEGAS, NV--(Marketwired - Jan 4, 2016) - At an event prior to the opening of the Consumer Electronics Show (CES), Faraday Future (FF) introduced its plan to rethink mobility, unveiling its FFZERO1 Concept and the proprietary engineering platform on which it's built, in addition to revealing the details of its strategic cooperation with Letv, a leading global technology brand. The company's first ever concept, the FFZERO1 is a high performance electric vehicle built upon FF's Variable Platform Architecture (VPA), a modular engineering system optimized for electric vehicles, on which all future FF production vehicles will be based. The VPA will enable FF to minimize production costs, deliver exceptional quality and safety, dramatically increase its speed to market, and could easily support a range of vehicle types and sizes. FF applied the high performance FFZERO1 Concept to the VPA in order to maximize the platform's potential and showcase its flexibility. FF also announced a strategic cooperation with Letv that will enable it to benefit from Letv's expertise in content and technology. The two companies will build advanced electric vehicles by bringing together resources from the following four domains: technology, automotive, internet and cloud, and entertainment content. Letv combines culture, content, innovation, lifestyle and entertainment with an array of products and experiences, and has an ecosystem that brings consumers premium content via a "six screens, one cloud" model, spanning flat screen TVs, smartphones, tablets, PCs, theater, and now, electric vehicles. "What we've announced illustrates the strength of our team, vision, partnerships and speed. We're a forward-thinking company focused on the future of mobility, but we also share a passion for driving and performance," said Nick Sampson, SVP, R&D and Product Development, FF. "On our platform, electric vehicles will not only deliver on sustainability, but will be seamlessly connected and exhilarating to drive." These announcements come on the heels of a reveal of FF's plans to invest $1 billion in the creation of a 3 million square foot state-of-the-art, environmentally conscious manufacturing facility in North Las Vegas. The company will break ground on this phase one investment in the next few weeks, and ultimately employ 4,500 people. 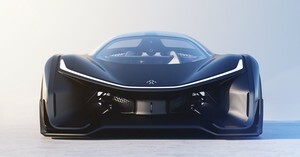 FFZERO1: a "Car of Concepts"
"The FFZERO1 Concept is an amplified version of the design and engineering philosophies informing FF's forthcoming production vehicles," said Richard Kim, head of design, Faraday Future. "This project liberated our designers and inspired new approaches for vehicle forms, proportions and packaging that we can apply to our upcoming production models." One of FF's core philosophies is to design from the inside out. Like future FF production models, the FFZERO1 Concept has a sixth sense for its drivers' needs: featuring adaptive personalization, seamless transfer of custom vehicle configurations, access to live images and real time data visualization. Faraday Future has directly integrated the smartphone into the steering column, representing the intersection of technology and automotive engineering. Conceptually, this setup could enable the smartphone to serve as the interface between the vehicle and the driver in -- and outside -- of the car. The FFZERO1 Concept could be fully autonomous, meeting its driver at the track and perhaps taking a few perfect laps on its own to compare with, and improve upon, its driver's performance. 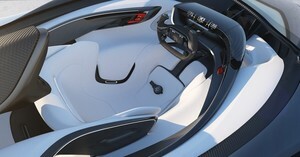 The FFZERO1 Concept's interior is primarily white with a carbon fiber finish - a pure and extremely clean aesthetic atypical for combustion engine race cars, but reflective of a clean, quiet electric vehicle. FF's soon-to-be signature "UFO line" runs around the center of the vehicle and is intended to give the sense that this vehicle is not completely of this world. Since its inception 18 months ago, Faraday Future's team of multidisciplinary experts from the technology, automotive, aerospace and digital content fields has dedicated itself to not only building the next generation of safe, reliable, high-quality electric vehicles, but also to creating an entirely new vision for mobility. In doing so, many design and engineering team members were encouraged to sketch out additional possibilities. One drawing of a high-performance racecar particularly intrigued Nick Sampson, who suggested building it on the VPA as a proving ground for FF's design and engineering concepts. Thanks to a dedicated team voluntarily working evenings and weekends, and a fully digital design process incorporating augmented and virtual reality tools, parametric design, and 3D printing, it was only a few short weeks before the FFZERO1 Concept evolved from a sketch into a parallel study from which the team draws inspiration and solutions for the company's future range of electric vehicles.